His Highness the Aga Khan, the centre’s founder and chair, has invested $35 million in the restoration of this building, completed in 1905. A team of architects and designers has invested many years of thought, research, and planning into rejuvenating the building to 21st century standards, while at the same time advancing the idea that this Ottawa landmark might be a catalyst for improving its environs. This has included removing asbestos from the walls and then insulating them; replacing all heating, cooling and lighting systems to improve energy efficiency; and introducing contemporary design elements to the building. Owned by the NCC, but now under the auspices of the Global Centre for Pluralism on a 99-year lease, the Tudor-Gothic structure built from massive blocks of Nepean sandstone and Gloucester limestone is the headquarters for a worldwide organization dedicated to encouraging us all to live together peacefully and productively in diverse societies. It is a 60,000 square foot, class A building, which basically means that it should be treated as a heritage building with minimal external intervention. This makes restoration much more difficult. But Toronto architects KPMB have plenty of experience handling the juxtaposition of old and new with their creation of the 65-foot tall Queen’s Lantern glass tower at the Museum of Nature. 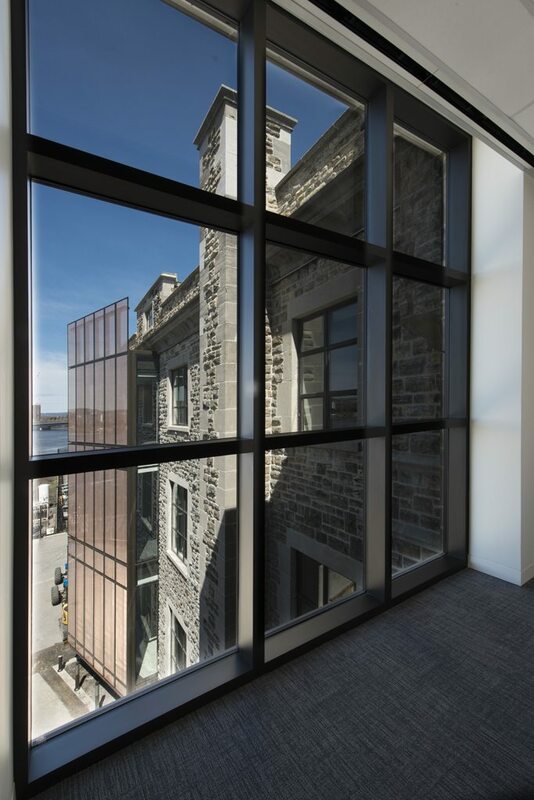 Here, the only significant structural change they have incorporated is a three-story glass window at the rear of the building, to connect the building to the Ottawa River, replete with all its symbolism as important meeting place between Indigenous people, French and English settlers. Called, “The Beacon,” it’s a symbolic open door to the river and to all of Canada’s cultures. When he took possession of the building, His Highness the Aga Khan went over to the Gatineau side of the river to get a feeling for how this might change the waterfront. The intention is that this “Beacon” should be a catalyst for rejuvenating the whole area, from Nepean Point behind the National Gallery, to Lady Grey Drive, which descends behind the Canadian Mint to water’s edge – currently an under-utilized parking lot in a spectacular position. The glass of the “Beacon” is several layers thick. 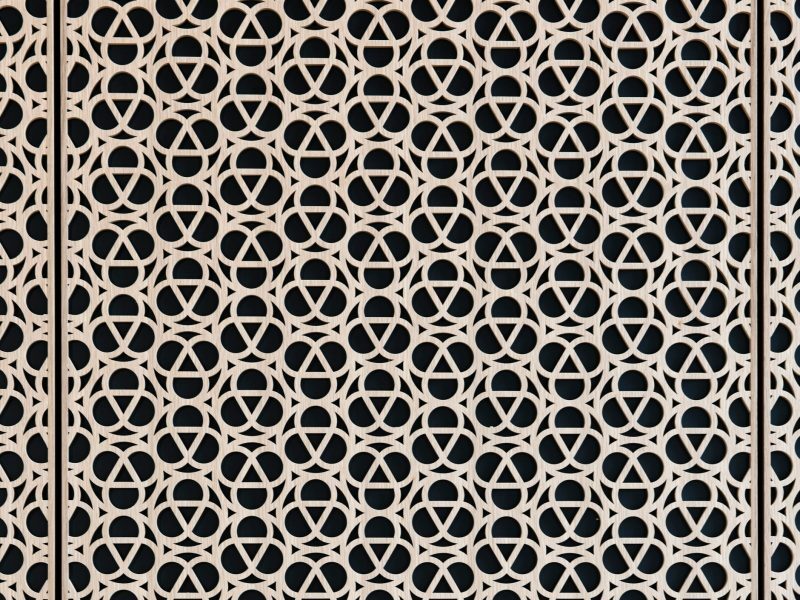 With copper mesh sandwiched between the panes to create a screen to filter light, it also has a further layer of black trefoils embossed on another pane. 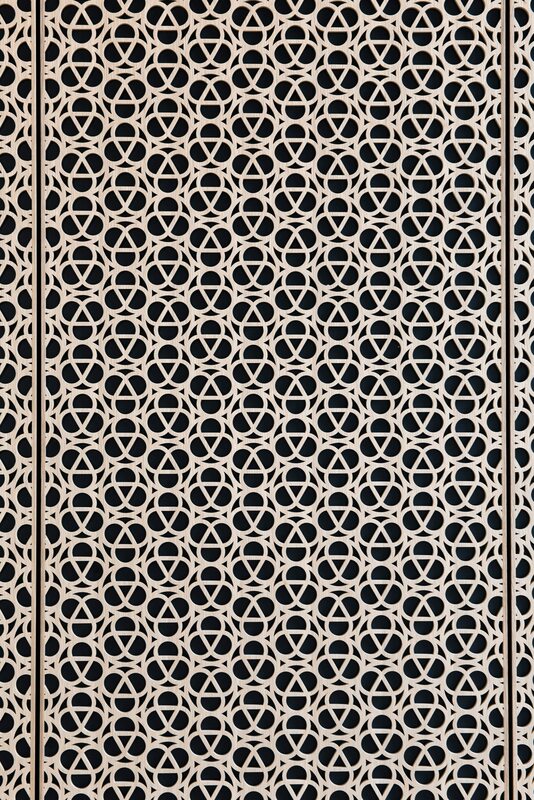 The copper is a nod to the copper accents and details found in the original archives building, while the trefoil is a motif that is repeated frequently – in carpets, light fixtures, and the gorgeous white oak laser cut panelling found in The Dialogue Centre. It is taken from the stone trefoil on the building’s parapet. The Dialogue Centre is a multi-purpose meeting and event room, available to rent for conferences and events. It’s suffused with light, with views to the Mint, the river, and the courtyard on Sussex Drive. It’s acoustically engineered, and is fully wired for live streaming and audiovisual, which can be shared worldwide in real time. This is an achievement, because there’s nary a wire to be seen. It’s all hidden behind laser-cut trefoil white oak panels, which line the walls and ceiling like a womb. The foyer, which features “The Beacon,” is an exercise in restraint. It’s open, airy and very white, with grey Danby marble floors from Vermont (the Quebec mine that supplied the original floors has now closed) and the original, vaulted ceiling, juxtaposed with a very contemporary chandelier-style light fixture. At the front of this imposing building,PFS Studio, working with KPMB Architects and Ottawa landscaper John Szczepaniak, has created an oasis of calm with a sense of increasing grandeur as you approach the huge, white oak front door. Raised flowerbeds, bursting with bulbs in early spring, give way to trees and ipe wood benches, which encourage people to stop awhile or enjoy lunch in the space. When the War Museum closed its doors in 2005, this building became a sad façade on Sussex Drive. A sensitive and expensive restoration has restored it to full glory. 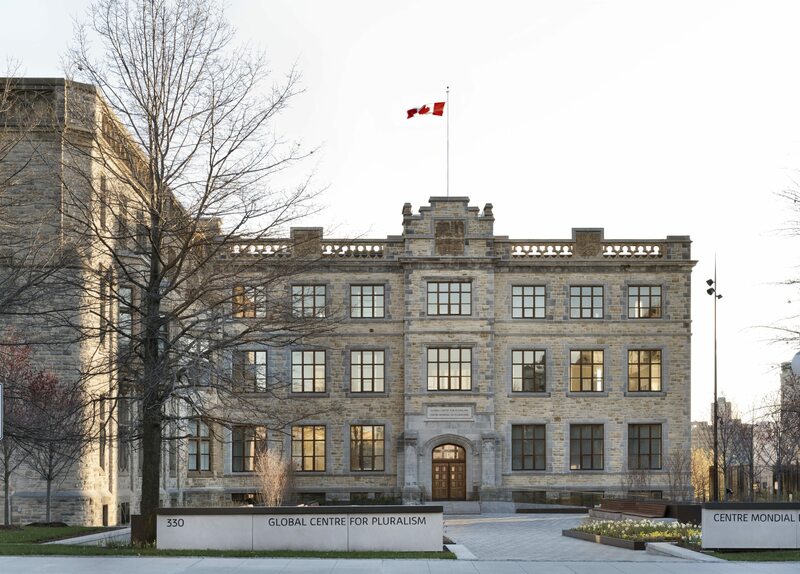 The Global Centre for Pluralism will be open for Doors Open Ottawa on June 3rd and thereafter on Wednesdays and Saturdays throughout the summer.